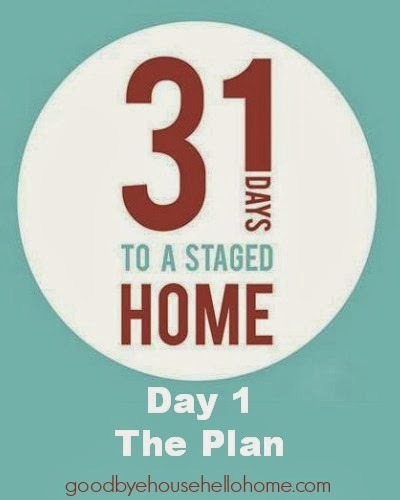 Welcome to Day 1 of 31 Days to a Staged Home! 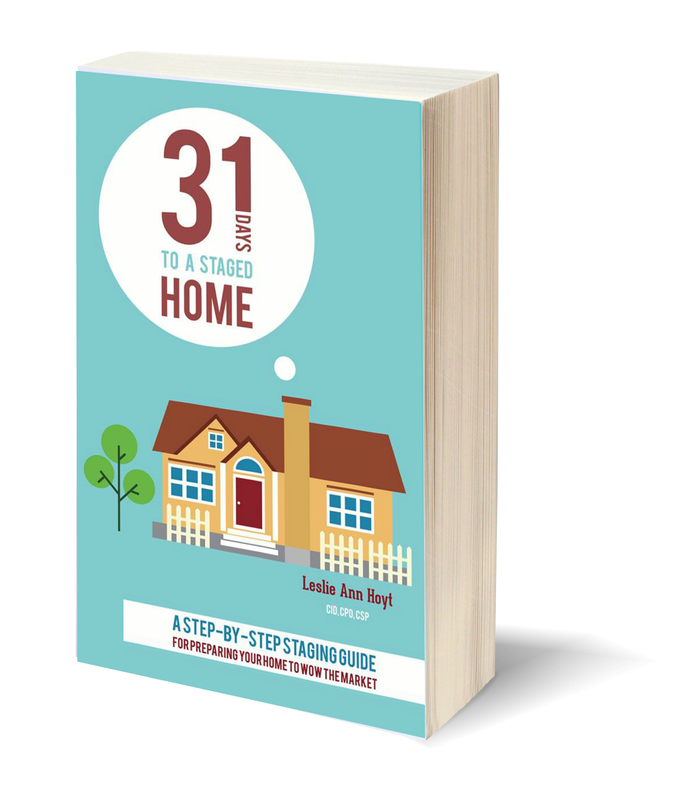 breaking down the steps into 31 segments so you can go from FOR SALE to SOLD! Certified Interior Decorator, Home Stager, and Professional Organizer. before HGTV's Designed to Sell and Sabrina Soto. with a background crew on hand to paint, repair, and move furniture. Real-life home staging involves a million tiny decisions and a million big decisions. Real-life home staging is messy, tiring, dirty, and can be chaotic. At least, it can be without a plan. Day 31, which will be devoted to a Q & A post, so ask your questions each day in the comments! Hope to see you tomorrow for Why Stage? I will be reading this every single day. I have one house the renovation is almost completed, and I want it sold yesterday. Then on to our house we live in..........oh boy is that going to be the challenge. By any chance do you live near the Florida panhandle??? SO glad I can help you! Staging is my passion! I am coming to Jacksonville then down to the Gulf Beaches area the third week of October. Why? As you read the series, you'll see that challenges can be overcome one step at a time! This is going to be such an awesome series Leslie! Great idea! I am putting my all into it because I love the topic so much! The timing could NOT be better! I'm with you here - 31 days here we go! Thank you for doing this series, Leslie! Thank you so much for this series! The hubby and I plan to sell next year! Can you stage your house even if you are not planning to sell? Is it possible to live in a staged house? I answered you in the post I wrote on Day 31. I love living in a "staged house", personally. Found you in the nick of time...will be following along because I have to get my house listed. Thanks! So excited for this series. What I site can you give me for staging a vacant home? What rooms are most important if you can't do it all? We are going to put our old house on the market again in a few months after having failed to sell it a couple years ago we have had a renter the past year, waiting for the market to come back a bit. I'm looking forward to the rest of the series, Leslie. I'm sure it will be great! I'm really looking forward to this series! We may be putting our house on the market in a couple weeks due to an out-of-state job change. Right now we're cleaning and putting a lot into storage, and also cleaned up and added lots of flowering plants to the front yard. So my question is - if we only have a week to get the house ready to sell, what few things make the most impact? We don't plan on selling our home any time soon, Leslie, but I am really looking forward to this series and your knowledge. I hope one day to have the opportunity to help someone-not-yet-known with staging their home. I am a bit of an organization geek myself, and I secretly cringe when I see home listings where the homes' potential is lost to buyers and could be seriously improved with even just a few changes. So here is my question, sweet friend: How does one go about getting a lead on staging a home and does one have to be a certified home stager first? I will be interested in reading your series - My hubs and I have sold 6 houses in 13 years (none of these are "flipped" - they were our homes) and none have ever been on the market longer than 6 months - three actually sold before the sign went in the yard, one in less than a month, one in two months, and our latest took the longest - 5 months (we closed in August). It will be interesting to see your take on things. I can't wait to read this! WEe are listing our house in the next few weeks and moving from Virginia to Colorado. Help! I am totally signed up for your series. It's going on my Pinterest page! My daughter-inlaw suggested I follow you and I am so glad she did. I need to place my house on the market so we can move closer to family. I have been looking for staging help and here you are! You will help me stay motivated to get done what all I need to do. Thank you. HI there! Just wanted to let you know that I am a loyal follower/student of your suggestions and we sold our house in 8 days!! At the highest price per square foot our neighborhood has ever gotten!!! THANK YOU SO MUCH!!! I had researched ways to help put my house on the market, but no one gave the well-rounded advice I found here. (Am I sounding like an infomercial? Sorry, but seriously!! We SOLD OUR HOUSE IN 8 DAYS! AT OUR ASKING PRICE!!! WHICH WAS HIGH TO BEGIN WITH!!!) Following your series made our house appeal to the buyer in the best form: an excellent house for a good price. Really, folks DO WHAT SHE SAYS!!! A couple of highlights: My husband and Broker disagreed with me on getting the house inspected before putting it on the market. But I insisted. It was already something I was thinking of doing, and your experience helped me plead my case. Why give the seller anything to negotiate!?!?! We were lucky that a distant friend was able to do it for us for a growler of local beer. He pointed out a few things in the crawl space that needed fixed. The actual home inspection from the sellers was still very stressful, but the only mark in the report was a dimmer switch had been miss wired. Also, your advice really helped me see that I wasn't cleaning off enough clutter. Clean EVERYTHING off the counters--even the coffee maker and especially the tooth brushes!! All of it! Every little bit of it. It will look empty to you, but it will look OPEN to the seller. Thanks for taking the time to write this! Can't wait to recommend your e-book!!! I am happy that I stumbled upon your blog and was very lucky I read EVERY WORD of this "31 Days" post prior to it being abridged due to your ebook. I still plan to buy (and of course recommend) your ebook, but I am happy to say-we just accepted an offer on our house after only 16 days on the market and 3 showings!One potential buyer asked if I'd had it professionally staged! And I am the opposite of a home decorator-type. Thanks for all the great ideas and the especially for the specifics. I just found this series but I'm excited to see where it goes. I have a lot of reading to do!